A good protection against DDoS attacks is a challenge. After all, how do you make a distinction between criminal Internet traffic and regular traffic? Moreover, DDoS attacks constantly evolve, and are becoming increasingly sophisticated. DDoS stands for “Distributed Denial of Service”. A DDoS attack causes an overload in your server, router or firewall. That’s because criminal traffic expressly causes a “traffic jam”, causing the intended target becoming (temporarily) inaccessible. This does not only lead to a tarnished image, but also a financial loss. 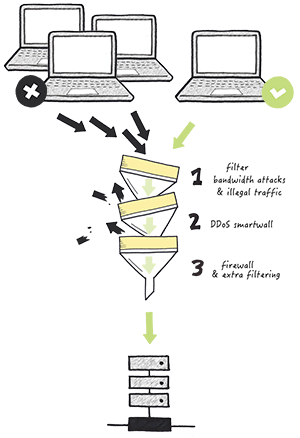 Luckily at Nucleus, we have methods to protect you against DDoS attacks: blackholing and mitigation. We protect all of our clients agains DDoS attacks with blackholing by default. We temporarily take the victim’s IP address of the DDoS attack offline to avoid that such an attack will endanger the entire network. We lead all of the criminal traffic to a so-called ‘black hole’. The target becomes unreachable for the attacks. And in most cases, the attack will stop by itself. After that, we immediately take the victim’s IP address back online again. Nucleus offers blackholing free of charge. Is this a protection in the strictest sense of the word? Not really. However, it is usually a solution to stop DDoS attacks relatively quickly. Using mitigation, all the traffic goes through a carwash. Only the normal traffic will come out shiny and clean on the other end of the carwash. The criminal – ‘dirty’ – traffic is flushed away thanks to the different filters. The mitigation solution of Nucleus works in real-time. All traffic is monitored 24/7. Do we notice something suspicious? Then we immediately lead all traffic to the carwash, to prevent a lot of trouble. Another advantage: your traffic is not affected by mitigation. It’s not routed to other servers for random checks, for example. What does DDoS protection mean for you?